Last week I suggested some criteria for screening prospective clients in regard to their relationship potential. Most firms don't do this. They qualify leads primarily based on the project opportunity. That's certainly a valid approach, but it can also be shortsighted. Projects build your backlog, but relationships build your business. Trust. The foundation of any good relationship is trust. 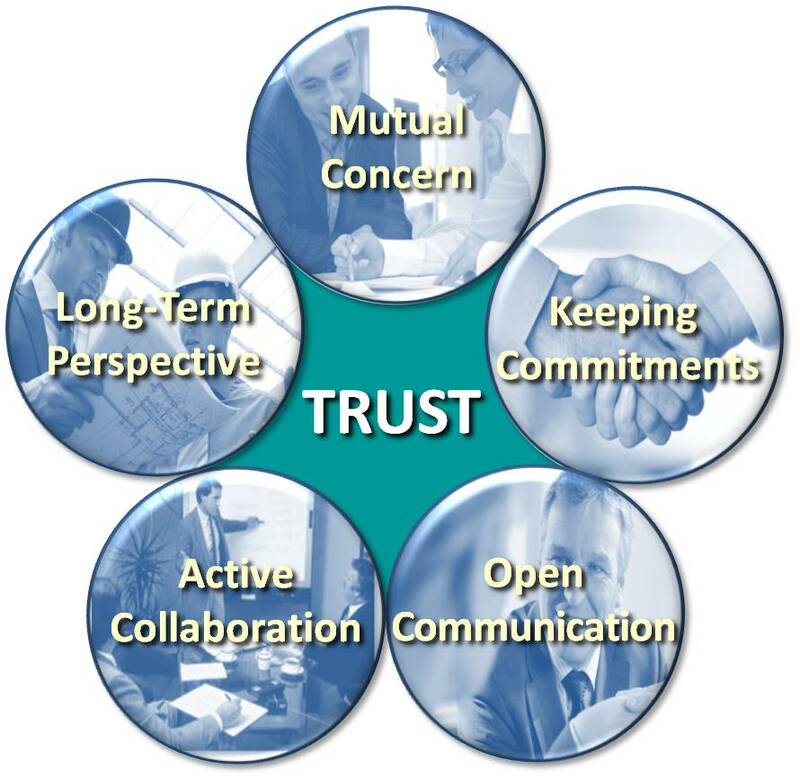 Building trust is also critically important in selling professional services. Our work, by its nature, is largely relational. We collaborate with clients, consult and advise them. And even our tangible work products (e.g., reports, site plans, construction documents) are, when delivered, mere representations of something still intangible. Trust is the connection between concept and completed reality. Researchers have identified three primary elements of trust: concern, competence, and candor. Of the three, competence comes most easily for us. But overselling competence during the sales process can actually undermine trust. Candor, for most technical professionals, is also a strength. We are generally known to be honest and trustworthy. But showing concern is a habitual shortcoming. Earlier in this series I mentioned the survey of clients that found that only 35% of professional service sellers demonstrated concern during the sales process. How can you show you care? It starts by actually caring; most of us aren't very good at faking it. But genuine feelings still must be evident in your actions. For more discussion on this, see my earlier post: "The Golden Rule of Sales." Mutual concern. Clearly, it's important that you show you care. But a strong relationship can never develop with one-way caring. The client must eventually have equal concern your firm's well being. That's not likely to happen during the sales process, of course. Still, you can take steps to encourage mutuality, with what I call "climbing the commitment ladder." In every meeting with the client, ask for some kind of reciprocal action. This will be small at first (e.g., asking for an introduction to another decision maker). Over time, you should ask for increasingly greater commitments on the part of the client. This will enable you to gauge how the relationship is developing. If the client is reluctant to respond in kind to your show of commitment, then that would suggest little interest in forming a relationship. Keeping commitments. Trustworthiness and reliability go hand in hand. The importance of keeping your commitments would seem self evident, but I'm amazed how often professionals will neglect following through on their promises (e.g., keeping the schedule). In the sales phase, there are fewer opportunities to demonstrate your reliability. But certainly you want to keep track of any actual or implied promises to the client. Be sure you deliver. If you're not sure what the client expects, ask. For example, one client survey I saw indicated that some clients interpreted infrequent, irregular sales calls as a lack of commitment. The best way to avoid this perception is to schedule the next meeting every time you visit the client. Open communication. Every relationship is bound together by communication. Conversely, weak relationships are almost always characterized by the lack of adequate communication. So where does this come into play during the initial stage of relationship development? Nothing will more quickly clue the current state of the relationship than the openness of your communication. But at this stage many technical professionals stifle communication by doing too much of the talking. That's the curse of traditional selling. By focusing on the client's needs and asking great questions, you encourage open communication. Keep in mind though, that some people warm slowly to being open, no matter what you do. Initial reticence may not necessarily preclude the potential for a good relationship eventually forming. For tips on inviting more open communication in the sales process, see these earlier posts: "Asking the Right Questions," Part 1 and Part 2. Active collaboration. If the client is collaborating with you in defining the problem and identifying solutions during the sales phase, your chances of winning the work are excellent. 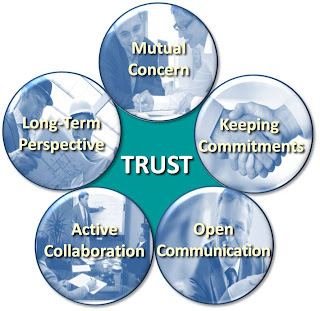 That's because collaboration typically only happens when there is trust, mutual interest, and openness. Therefore it's a great objective to have during this stage of the relationship. You lay the groundwork for collaboration by the way you conduct the sales conversation. If you're asking great questions, uncovering needs and expectations, and offering helpful advice and information, it's a natural transition to active collaboration. How will you know when you get there? When the meeting has more the feel and structure of a project planning session than a sales call. Collaboration is win-win. Make it a goal of your sales process. Demonstrate early that you're a valuable resource in helping the client plan the project, and formally ask for that opportunity when the time seems right. Collaboration is "sample selling" at its best; give the client a taste of what it's like to work with you. Assuming you're good at what you do, that will strongly position you as the firm of choice. Long-term perspective. Relational selling is in sharp contrast to the usual transactional sale. In the latter, there is a short-term focus on simply getting the contract. In a relational approach, the contract is merely the first step toward what you hope will evolve into a long-term relationship. Of course, every firm hopes the first contract will lead to more work. Does the difference between the two approaches really matter? I think so. Going back to my earlier post, it certainly makes a difference whether you have a one-off date with someone or whether you're looking for a spouse when you have that first date. In the first case, having a good time is the objective; in the second, there's the realization that a critical dimension of that "good time" is the shared relationship. So it is in our business. Clients don't really just purchase design or consulting services. They buy a relationship with a provider of design or consulting services. The product is interactive, so the working relationship largely defines the perceived quality of the product. Consider the research that has found that clients value the experience as much as the expertise you provide (see "The Experience Trumps Expertise"). None of us like being thought of as a commodity. But unless the relationship is part of the offering, that's likely what you have become. Few firms have truly distinctive expertise. The real differentiator is the experience the client has working with you--the relationship. So build into your sales process a long-term perspective, not just chasing projects, but starting relationships. What Can We Learn From Matchmaking Sites?